Wooden structures that have been painted colourfully fill the space of the gallery. Kids and adults alike interact with the art as if it were playground equipment. The space has been transformed through art that was constructed from community donations of wood. 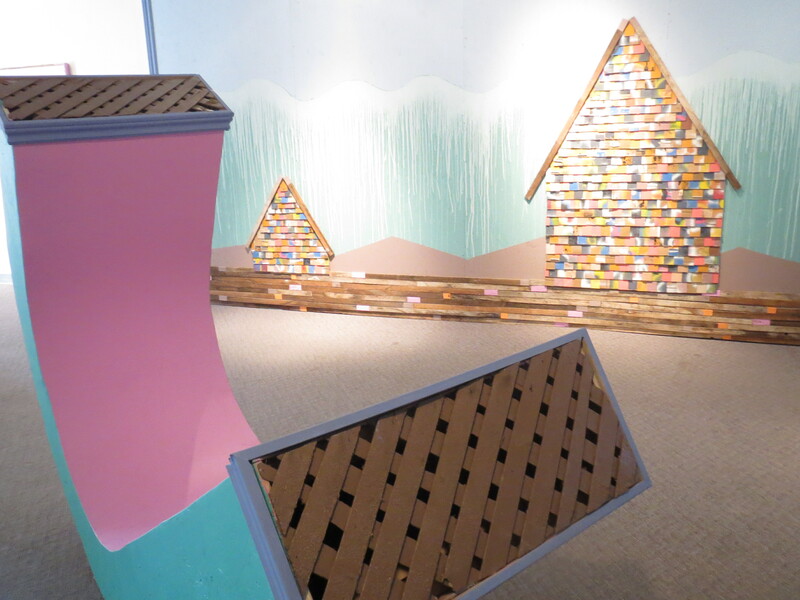 Steve deBruyn’s exhibition Get Away Vehicle: Part One is an art experience filled with playful colour. It celebrates the creation of new things from the old. The construction process of deBruyn’s work is an integral part. During a short-term residency, the artist gathers materials from the community. These include used items, scrap wood, and reused parts from his previous shows. For this exhibition, The Home Depot donated over $200 worth of supplies. Local theatre companies and members of the arts community donated materials as well. With all these donations, Steve’s work becomes possible and the artistic vision is born. Through the use of countless power tools and the help of gallery staff and volunteers Steve’s visions are manifested. During the week of Steve’s residency, I was put to work. I learned how to use a number of power tools such as a nail gun and a miter saw, as well as other neat devices like a caulking gun and a panel lifter. Everyday of Steve’s residency was filled with anticipation and hard work. I had the opportunity to be involved in the creation of each of Steve’s pieces. I watched and worked as I saw pieces come together to make a whole show. I received instruction from the artist, not knowing the end result. My continued diligence led to a show that was ultimately complete and beautiful. As I was involved in the construction of these pieces, I couldn’t help but ponder the purpose of having others do so much work. Then I realized if I was an artist wanting to teach someone about my craft, the best way to teach them is to get them involved in the creation. This endeavor was certainly a learning experience for the sake of art. During the 5-day span, I learned practical construction skills. I was also glad for the opportunity to work hard and to take my mind off of other stresses. This brings us back to the theme of the exhibition. The title of the show is Getaway Vehicle: Part One. Art is a vehicle that allows artists to flee from the hassles of everyday life. From the vision that goes into the idea to the actual production of the work, art provides an escape. Through art, an artist has control over a medium, as well as the ability to manipulate materials and to manifest something that only existed in their mind. This show was a great opportunity to learn from an artist and to see the steps it takes to produce an artwork. Through this experience I was able to see first hand the fruit of an artist’s labour. White Water Gallery would like to thank Home Depot (North Bay), Allan Hirsh & Joan Ferneyhough, Arndt von Holtzendorff & Mandy Kerr, and Leah Symington for their generous contribution of materials.